MF101 is an oven-fresh mutual fund podcast by Aditya Birla Sun Life Mutual Fund in association with Bloomberg|Quint. 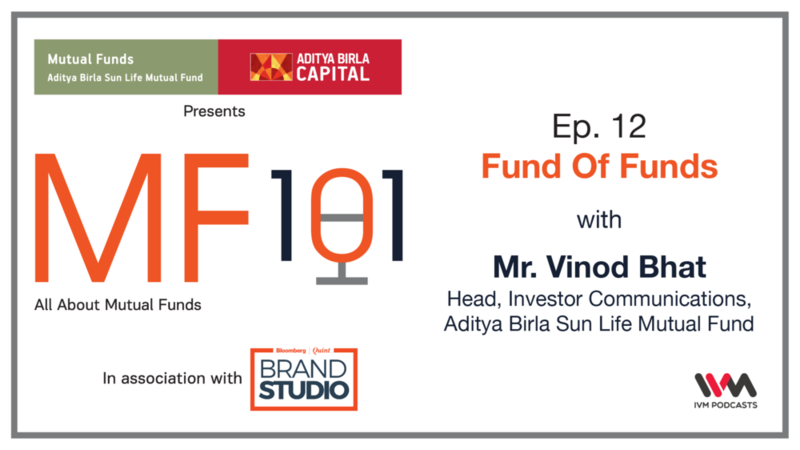 This is the final episode of MF101 with our very own chef Mr. Vinod Bhat, Head, Investor Communications, Aditya Birla Sun Life Mutual Fund. Mr. Bhat has an overall experience of more than 16 years. He holds an MBA in Finance from The Wharton School. The conversation revolves around key recipes for understanding the concept of Fund of Funds, benefits to investors, the market and more. Ep. 11: Are Debt Mutual Funds For Me? MF101 is an oven-fresh mutual fund podcast by Aditya Birla Sun Life Mutual Fund in association with Bloomberg|Quint. This is the eleventh episode of MF101 with our very own chef Mr. Maneesh Dangi, Co-CIO Debt, Aditya Birla Sun Life Mutual Fund. Mr. Dangi has more than 13 years of experience in Finance and Research. The conversation revolves around key recipes behind the concept of debt mutual funds, characteristics of debt mutual funds, current scenarios around debt mutual fund investments and more. MF101 is an oven-fresh mutual fund podcast by Aditya Birla Sun Life Mutual Fund in association with Bloomberg|Quint. This is the tenth episode of MF101 with our very own chef Mr. Chanchal Khandelwal, Co-Fund Manager and Senior Research Analyst, Aditya Birla Sun Life Mutual Fund. Mr. Khandelwal has an overall experience of around ten years, of which seven years is in the financial markets with Aditya Birla Sun Life. He also holds a B. Com from Shri Ram College of Commerce (Delhi) and an MBA in Finance from Xavier Institute Of Management. The conversation revolves around key recipes for understanding the consumption patterns and their importance, drivers of consumption in India, lifestyle changes in India and more. MF101 is an oven-fresh mutual fund podcast by Aditya Birla Sun Life Mutual Fund in association with Bloomberg|Quint. This is the ninth episode of MF101 with our very own chef Mr. Bhupesh Bameta, Economist, Aditya Birla Sun Life Mutual Fund. Mr. Bameta has a demonstrated history of working in the financial services industry for over nine years. He has worked with Quant Capital and Edelweiss Financial Services before joining Aditya Birla Sun Life Mutual Fund. He holds a B.Tech. degree from IIT Kanpur and is also a Chartered Financial Analyst (CFA). The conversation revolves around key recipes behind the importance of geo-politics in debt funds and investments. MF101 is an oven-fresh mutual fund podcast by Aditya Birla Sun Life Mutual Fund in association with Bloomberg|Quint. This is the eighth episode of MF101 with our very own chef Mr. Pranay Sinha, Fund Manager, Aditya Birla Sun Life Mutual Fund. Mr. Sinha has a vast experience of around 11 years in the financial markets. He has worked with companies likes BNP Paribas Bank and JP Morgan before joining Aditya Birla Sun life Mutual Fund. He holds a P.G.D.M. from IIM Calcutta and a B.Tech. Degree in Aerospace Engineering from the IIT Kharagpur. The conversation revolves around key recipes such as understanding food inflation in India, short term and structural views on food inflation, a deep-dive into understanding core inflation and much more. MF101 is an oven-fresh mutual fund podcast by Aditya Birla Sun Life Mutual Fund in association with Bloomberg|Quint. This is the sixth episode of MF101 with our very own chef Mr. Dhaval Shah, Fund Manager, Aditya Birla Sun Life Mutual Fund. He is a CFA from AIMR, USA. He has been into the Equity Market for more than 14 years and has worked with companies like Reliance Mutual Fund, Morgan Stanley Investment Management and Edelweiss Institutional Equities before joining Aditya Birla Sun Life Mutual Fund. The conversation revolves around key recipes behind India’s growth in sectors such as pharma, consumer durable and electrical sector, deep insight into the pharma sector, outlook for at all 3 sectors going forward and much more. MF101 is an oven-fresh mutual fund podcast by Aditya Birla Sun Life Mutual Fund in association with Bloomberg|Quint. This is the sixth episode of MF101 with our very own chef Mr. Kunal Sangoi, Fund Manager, Aditya Birla Sun Life Mutual Fund. He is a Chartered Accountant and has more than 13 years of experience in IT and other sectors. Mr. Sangoi always wanted to build a career in equity market and has worked with Edelweiss Securities before joining the Aditya Birla Group. The conversation revolves around investment analysis for various emerging sectors, their strengths and weaknesses, few major trends to look for in 2019 and more. MF101 is an oven-fresh mutual fund podcast by Aditya Birla Sun Life Mutual Fund in association with Bloomberg|Quint. 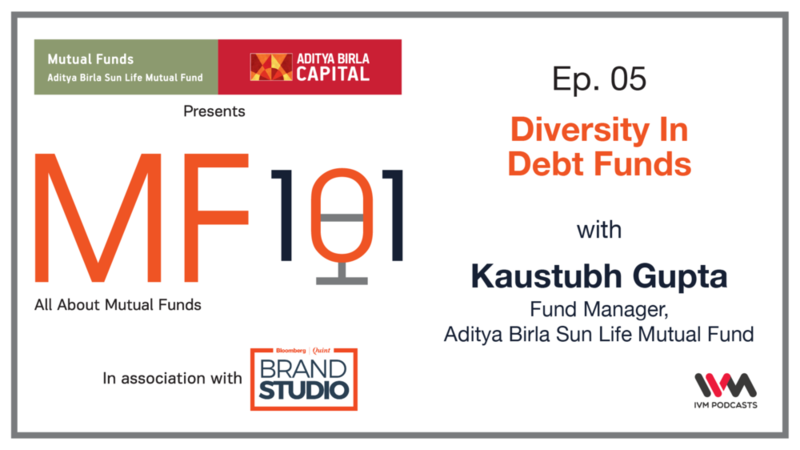 This is the fifth episode of MF101 with our very own chef Mr. Kaustubh Gupta, Fund Manager, Aditya Birla Sun Life Mutual Fund. Mr. Gupta has extensive investment experience and has worked with Aditya Birla Sun Life Mutual Fund for more than 9 years. He is also a qualified Chartered Accountant. The conversation in this episode revolves around what are the key recipes for newbies investors while choosing a debt fund for investment, various categories of debt funds, an debt fund overview of 2018 and much more. MF101 is an oven-fresh mutual fund podcast by Aditya Birla Sun Life Mutual Fund in association with Bloomberg|Quint. This is the fourth episode of MF101 with our very own chef Mr. Vineet Maloo, Fund Manager, Aditya Birla Sun Life Mutual Fund. Mr. Maloo has extensive experience and has worked with Aditya Birla Sun Life Mutual Fund for more than 12 years. He is a qualified Chartered Accountant.The conversation revolves around key recipes such importance of asset allocation, working of hybrid mutual funds, what is static investing versus dynamic investing, and much more. MF101 is an oven-fresh mutual fund podcast by Aditya Birla Sun Life Mutual Fund in association with Bloomberg|Quint. This is the third episode of MF101 with our very own chef Mr. Jayesh Gandhi, Senior Portfolio Manager, Aditya Birla Sun Life Mutual Fund. Mr. Gandhi has a vast experience in investment management and equity research and he also holds the Chartered Accountant and Chartered Financial Analyst designation. The conversation revolves around key recipes like section process of small and midcap funds, outlook for the class of small and midcap stock, and more. MF101 is an oven-fresh mutual fund podcast by Aditya Birla Sun Life Mutual Fund in association with Bloomberg|Quint. This is the second episode of MF101 with our very own chef Mr. Milind Bafna, Fund Manager, Aditya Birla Sun Life Mutual Fund. Mr. Bafna has a vast experience of around 22 years in the industry and he deals in Indian Equities using a value investing approach. The conversation revolves around key recipes like strategies adopted by investors in the current market scenario, market outlook across sectors for the next year, and more. MF101 is an oven-fresh mutual fund podcast by Aditya Birla Sun Life Mutual Fund in association with Bloomberg|Quint. This is the opening episode of MF101 with the Head Chef Mr. Mahesh Patil, CIO – Equity, Aditya Birla Sun Life Mutual Fund. Mr. Patil has extensive experience in fund and investment management, equity research, and corporate finance. The conversation revolves around key recipes such as how 2018 was for equity markets, what are the key events to watch out for from an equity markets perspective in 2019, and more.